Flirt4Free will give away more than $20,000 in credits and cash prizes to models and customers during the cam platform’s Halloween Celebration, a six-day event starting Oct. 26. In addition to changing graphic elements to make the site more festive, Flirt4Free will host a number of themed contests, including a model pumpkin hunt, a trick-or-treat contest for customers and daily model costume contests. Starting at midnight Oct. 26, customers may gift digital pumpkins to their favorite performers, collect digital candy so they can compete in the trick-or-treat contest and vote for their favorite costumes every day. During the model pumpkin hunt, models will collect digital pumpkins from customers; the male and female models who earn the most pumpkins will win $1,000 each. The male and female models who receive pumpkins from the most customers also will win $1,000 each. Second-place winners in both contests will win $500 apiece, and third-place winners each will receive $250. Fourth- and fifth-place winners of both contests will receive $150 and $100, respectively, and those who place sixth through 10th will win $50 each. 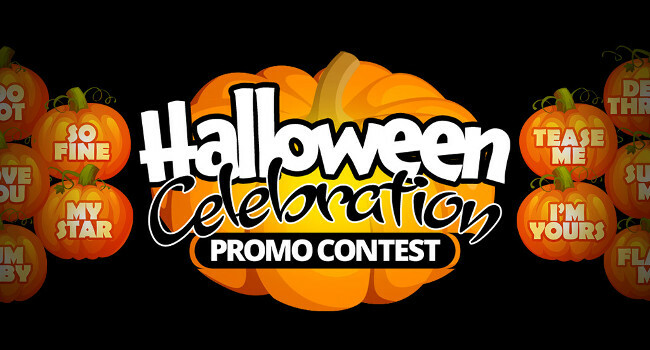 In addition, the customer who gets candy from the most models during the customer trick-or-treat contest will walk away with $500 worth of credits. Fans may vote for their favorite models on Twitter during Flirt4Free’s Spooky Selfie Model Costume Contest. Starting Oct. 30, models will tweet pictures of themselves in their costumes while tagging @Flirt4Free and #F4FSpookySelfie. The three models who get the most retweets and likes by midnight Oct. 31 will win a $100 prize. The six-day celebration is one of Flirt4Free’s longest-running events, and hundreds of models reliably join the festivities with their own contests, costumes and spooky-themed rooms. For more information of Flirt4Free’s Halloween Celebration, click here.